Boko Haram extremists have reportedly kidnapped more than 400 women and children from the Nigerian town of Damasak, which was freed earlier this month by Niger and Chad troops. The mass kidnapping took place in northeast Nigeria, on the country’s border with Niger. The Niger commander of the Niger-Chad forces in Damasak, Lieutenant Colonel Toumba Mohamed, has confirmed that residents had reported between 400 and 500 women and children were kidnapped. According to Reuters, witnesses suggested that the number of kidnapped could be around 500 people. “They took 506 young women and children [in Damasak]. They killed about 50 of them before leaving. We don't know if they killed others after leaving, but they took the rest with them," Souleymane Ali, a trader, told Reuters. The figures have not been officially verified. On March 17, Nigeria’s army managed to regain control over large swathes of the northeast of the country, but the extremists are still in control of three regions. Last week, troops from Niger and Chad found the bodies of about 100 people buried in a mass grave under a bridge leading out of Damasak. 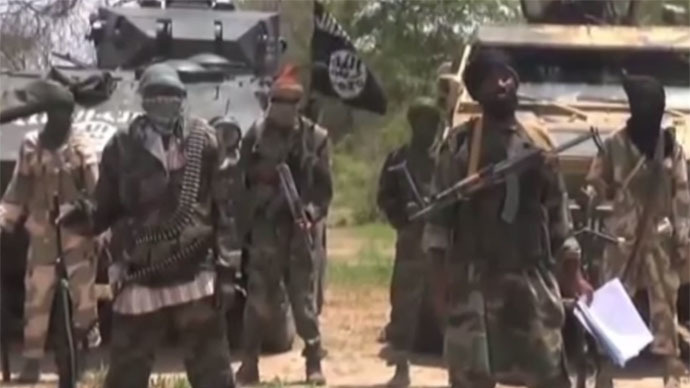 In the beginning of the year, Boko Haram controlled 20 regions of the country. But after an offensive by the Nigerian army, with its allies from Chad and Niger, the militants lost a number of battles and had to withdraw from most of the territories they were controlling. Nearly 300 schoolgirls were abducted by Boko Haram in the town of Chibok last April. This caused international outrage and attracted global attention to their six-year insurgency. Elections planned for last month in Nigeria, Africa's most populous country, were delayed due to a sharp increase in violence.